By Mr. Giorgos Venetoulias who created a remarkable collection of tales from the popular tradition. The collection includes almost all the narration: myth, magic tale, novel, bizarre narration, and staggered fairy tale. The preface was written by the professor of Folklore, Mr. M.Meraklis. The book is in the 4th edition. 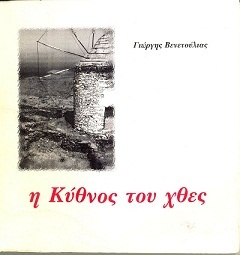 A remarkable effort to rescue and record the folk culture of Kythnos is the book by Mr. Giorgos Venetoulias “Ten Traditions from the Chora of Kythnos”, a publication of the Community of Kythnos (1998). This book includes narratives from the people of the countryside, the farmland and generally the ordinary everyday people living on the island. A collection of records by Mr. Giorgos Venetoulia with folk songs of the island. The collection includes chants from the entire range of folklore poetry (lullabies, parodies, carols, wedding songs , mourning songs, etc.). A full and systematic recording of local ceramic artifacts, pottery activity on the island, Kythnian ceramic potters, ceramic workshops etc. It is a book-album with colorful artistic photographs by Mr. Giorgos Venetioullas. An Anthology of 30 folk fairy tales from the Cyclades, from rare and scarce publications, as well as unpublished tales recorded and collected by Giorgis Venetoulias. Professor of Folklore, Mrs. Marianthi Kaplanoglou, has written the preface. A total of 104 traditional tales (legends) recorded by Giorgis Venetoulias, and classified by subject. Fairies,pirates, miracles, etc. The album is adorned with black and white artistic photographs taken by Mrs Kathleen Sakkopoulos. Mr. Varvounis, professor of folklore has written the preface. Two CDs with old and new music recordings, accompanied by a book about the musical tradition of the island. Foreword by Mr. Manolis Glezos. 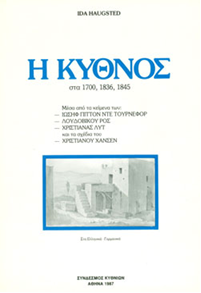 A publication of the Association “Cultural Intervention of Kythnos Youth”. Production: Melodic Boat (Melodiko Karavi). Edited by Giorgis Venetoulias. All wedding songs as well as songs of the island in cd, with a 32-page booklet which is a folklore study by Mr. concerning the traditional wedding ceremony in Kythnos. Friendly participation: Panayiotis Lalezas. 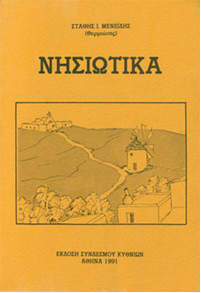 A publication of the Association “Cultural Intervention of Kythnos Youth”. Production: Melodic Boat (Melodiko Karavi)..
Island songs featuring Panagiotis Lalezas. 18 Cycladic songs from Kythnos, Mykonos, Naxos, Paros, Serifos, Sifnos, Amorgos and other islands, performed by the top singer of local folklore songs, Mr. Panayiotis Lalezas. Preface and editing: Mr. Georgos Venetoulias. A release by the Association “Cultural Intervention of Kythnos Youth”. Production: Legend. By Mr. Antonios N. Vallindas. 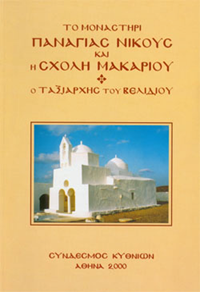 First publication in 896, reprinted in 1990. A publication of the Association of Kythnians. By Mr. Stathis I. Meneidis (Thermiotis). Published in 1991 by the Association of Kythnians. An album with old photographs of the island classified according to their subject. By Mr. Giorgos Venetoulias. The Monastery of Panagia Nikous (Virgin Mary, the Victorious) and the Makarios School. Taxiarch of Velidion. Published in 2000 by the Association of Kythnians. Selected parts from the essays of Joseph Joseph Pitton de Tournefort, Luis Ross, Christianna Lytt and the drawings of Christian Hansen. 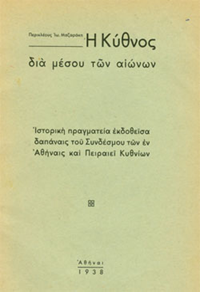 Published in 1987 in Greek and German by the Association of Kythnians. 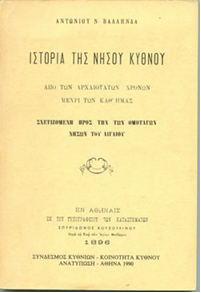 Historical treatise published with the expense of the Association of the Athens and Piraeus Kythnians. By Pericles Ioannis Mazarakis, Published in 1938. Association of Kythnians.